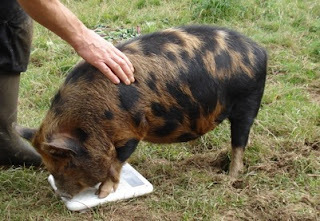 Weights and Measures: a note in the diary reminded us that we had to “worm” our two pigs, which is to say that we need to administer a medicine that will act against intestinal worms as preventative maintenance. We bought the wormer (vermifuge in French) and a graduated syringe with a brass end that they can chew without damaging it, from the vet. The instructions on the bottle said we should give 0.5 ml per kilogram of pig, so we needed to know how much our pigs weigh. Some weeks before, vainly trying to save our potatoes and tomatoes from blight (called mildou [mildew] here) we decided to buy a fungicide (authorised for use in organic agriculture!) to protect them. The dosing instructions on the packet were immensely useless, advising me (in French) that I should apply 2 kilograms per hectare (2.5 acres) bearing in mind that it was only a one kg packet. There was not even a suggested rate of dilution. Imagine yourself standing in front of a half-hectare field, next to a convenient tap, with a watering can in one hand and the packet of blue powder in the other: where could one possible start making sense of it all? For the poultry wormer, the 240g tub of powder proudly states that it will treat 200kg of feed. Now we only have ten chickens of different sizes who are not going to munch their way through 200kg of feed in the required week that they should eat the treated grain. I had to measure what they ate in a week, weigh it, and then calculate the equivalent in worming powder, and it’s not much. The necessary amount wouldn’t get our kitchen scales off zero. What would have been more useful is a volume measurement in millilitres or (fractions of) teaspoons, related to weight or volume of feed. In the end, I tipped the whole tub out and spooned it back using quarter-teaspoon measures to work out how much volume the 240g tub comprised, then calculate how many quarter-teaspoons I should add to 20 kg of feed, job done. Back to the piggies: my problem here was not so much non-existent or unsuitable measures for the product, just that I needed to find out how much our porkers weighed. The only thing we have suitable for weighing something so heavy as a young Maori pig, were the bathroom scales. 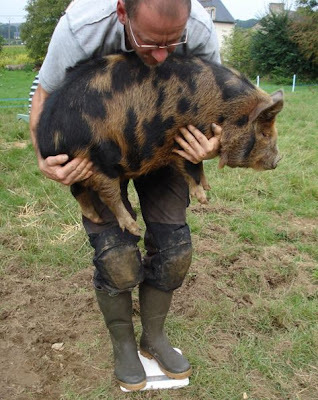 After several unsuccessful attempts to make our pigs stand with all four feet on the scales, I ended up having to pick them up and weigh us both, then subtract my own weight. As you might imagine, holding 40 kg of squealing pig, unused to being this high up, while trying to keep steady and read the scales, was a whole lot of fun. (See top photo). 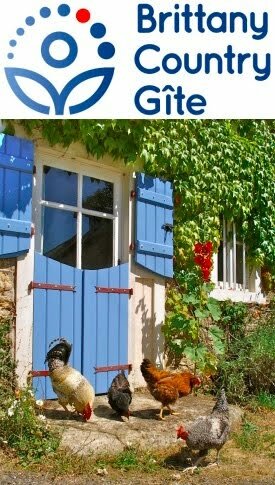 As a postscript to all this talk of giving the pigs and poultry their worming medicine, I recently came across the website of Huntstile Organic Farm, specifically the page on organic farming, where they explain that for organic farmers, “parasite problems in farm animals are controlled through regularly moving the animals to fresh pasture and other preventative methods rather than routinely dosing the animals with drugs.” It’s been our first year with pigs and sheep and so we’ve followed conventional wisdom. We shall find out more and see if we can organise our animals and their paddocks so that we can avoid unnecessary medication in the future. I've been reading a bit about using copper sprays for controlling fungal problems... and it's not very positive. It's true that you are allowed to use them under the organic rules, but they are a very potent biocide (worms absolutely hate the stuff) and regular use can cause a copper build-up to dangerous levels in your soil. That said... I just sprayed all our fruit trees with copper oxychloride to combat the curly leaf fungi. Hopefully by next year we'll have fungal compost teas brewed which will allow us to build up a diverse biology of fungi to out compete the nasty ones. In general this is the technique that I try to apply to most circumstances. Build up a stable diverse biology to fill all the niches so there is no opportunity for the pathogens to colonise. My permaculture teacher had a good saying - "It's a race for space"
As for the animals, there is a Aussie writer you could look into called Pat Coleby... she is an expert on managing animals mineral intake to control parasites and ensure health. Thanks for your comment, Nick. One needs to be very self-disciplined to follow the permaculture path, especially during the setting-up period, before all the systems are in place and working in a synergistic and balanced way. There's been many a time when I've thought about doing something in a non-permacultural way, justifying it to myself that it's just to get us going ... mostly, I've resisted the temptation. We were so upset to loose all our potatoes and then tomatoes that when I saw the fungicide in our organic store, I didn't need much persuasion. We lost the plants anyway, so sprayed for no reason. The old lady next door just put a small off-cut of copper wire through the stem of the plant but I've yet to ask her if this protected her plants. Thanks for the tip on Pat Coleby and we shall look forward to reading all the details on your blog about your fungal compost teas. I know all about Pat, she had a fantastic goat herd in OZ! 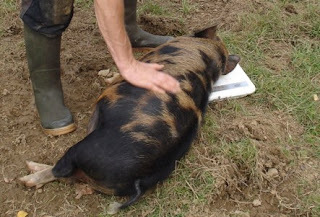 To be honest I wouldn't bother about worming porkers unless they are confined to a very small area for a very long time which by the nature of the fact of their destination, they wont be! Feeding garlic powder in the feed of both free range hens and free range pigs is a better bet and also as your ground had no animals before you started it was 'clean' so therefore much easier to keep the animals with a low worm burden than if you had inherited sheep sick ground! I will explain more when I see you! Good looking pig--can't wait until I get mine at the end of October. What?! no pics of the wedding? Not even a little "story" in the blog? And lastly---rotate your sheep, good minerals make a HUGE difference (we do liver testing when we butcher) and some dried garlic in their minerals will help too. Email me if you want to talk organic sheep worming---though we do have "slightly" different climates but I might have some useful information.